A proposed wind turbine for the Grey Barn and Farm in Chilmark complies with Massachusetts Department of Environmental Protection (MassDEP) noise policy guidelines, according to a study conducted over a 17-day period in March by Tech Environmental Inc. an air quality and noise issue consulting firm. Just how close farm owners Eric and Molly Glasgow are to erecting a turbine is unclear. Ms. Glasgow said everything is on hold right now, including the wind turbine, because of a fire in May that heavily damaged the Grey Barn Farm’s milk processing facility. As a result the farm stand is not currently open. 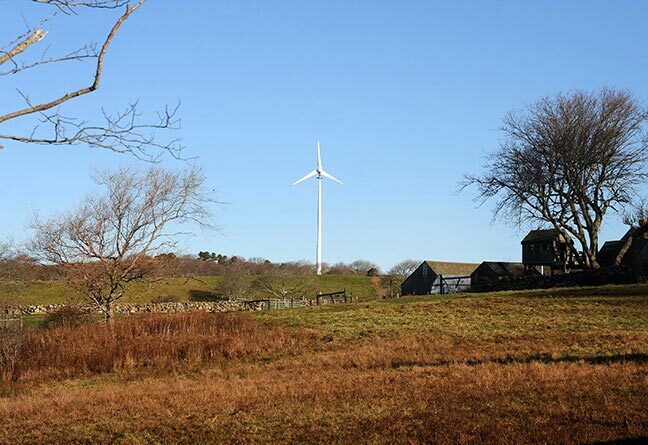 This week, Chilmark building inspector Lenny Jason said a building permit for the wind turbine issued in 2011 has expired, and the Glasgows will have to reapply if and when they decide to erect a turbine. The acoustical report posted on the Chilmark town website July 10 was prepared for Aegis Wind, a Vermont wind turbine company. The study examined existing sound levels and wind speeds on the project site, and sound levels in nearby residential areas from March 4 to March 21, according to the report. The study concluded that the proposed turbine, a Northern Power NW100 100-kilowatt wind turbine with a 30-meter hub height, “will not create a nuisance” since it is in compliance with Mass Department of Environmental Protection (DEP) noise policy. The acoustic study reported that existing background sound levels during times when winds were high enough to support turbine operation were generally in the range of 25 to 60 dBA. This sound level is similar to dBA indoor rates ranging from an empty concert hall to normal speech from one meter away. Rustling leaves or a quiet urban area during the day would generate similar outdoor sound levels. All predicted sound level increases are expected to comply with MassDEP noise policy, and compliance with the policy provides a “reasonable basis for concluding the community wind project will not create a nuisance,” according to the study. The farm’s energy infrastructure includes a 92KW solar electric array and a 480-square foot solar water heating system funded in part by three state grants totaling $105,190. According to Matt Kakley, a media spokesman for the Massachusetts Clean Energy Center, the acoustic study cost $14,600, and was funded in part by the Massachusetts Technology Collaborative Renewable Energy Trust. Mr. Kakley said the agency contributed $11,600, and the Grey Barn Farm paid for the remaining cost. The trust also helped fund existing turbines at Morning Glory Farm in Edgartown and the Allen Farm in Chilmark. The two farms each received a $100,000 rebate through the trust’s small-scale wind program, Mr. Kakley said. In January 2011, after three hours of emotional debate on both sides, the Chilmark zoning board of appeals (ZBA) upheld the town building inspector Lenny Jason’s decision to issue building permits for the Grey Barn Farm and the highly visible Allen Farm, off South Road. 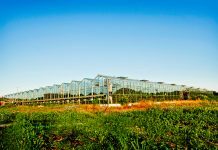 Mr. Jason issued the permits without hearings of any sort, pursuant to state law that allows such action under certain circumstances for commercial agricultural operations. A state agricultural exemption allows an applicant to bypass the town zoning bylaws as long as they use more than 50 percent of the energy produced by turbines for commercial agriculture. 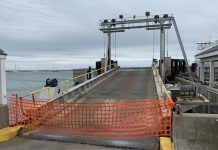 In a separate decision, the zoning board decided not to refer the two turbines to the Martha’s Vineyard Commission (MVC) for review as a development of regional impact (DRI) because both turbines fell just short of the 150-foot threshold that would automatically trigger a review by the MVC. The Allen Farm erected its turbine in November 2011. Farm owners Mitchell Posin and Clarissa Allen said at the time they expected the wind turbine to produce twice the energy needs of their farm.